I received an email from Esther’s mom. 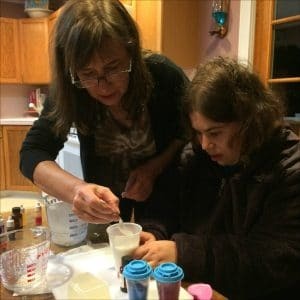 She told me that Esther was a 22 year old special needs girl who loved crafts and she wanted to learn how to make soap. We emailed back and fourth and decided that melt and pour soap would be appropriate for Esther. I put together a custom soap making class just for her. Esther was smiling while we were making soap. I think she especially enjoyed picking out the colors for her soaps. We made some layered soaps, some embed soaps, and used up plenty of glitter. She made a special soap with a heart embedded in the middle for her dad, and since her mom loved the pumpkin spice fragrance oil, we made sure that soap was especially pretty. We spent about 2 hours together. She picked up melt and pour soap making quickly, remembering to microwave the soap chunks in 30 second intervals. She was careful when pouring the melted soap into the molds. She told me she was excited to use her soap in the morning and couldn’t decide which one to use first. It was a successful afternoon. Did you know I do custom soap making classes? This is so wonderful! A true artist shares his/her gift so others can benefit, and you go above and beyond. I look forward to learning soap with you in January! Many blessings for a happy and healthy holiday. Thanks! 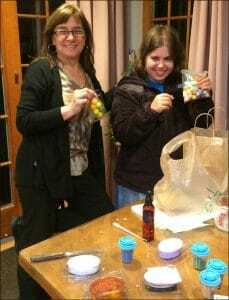 I really enjoy making soap Kristen, and I’m looking forward to teaching you!